Read the last chapter of the previous book. Usually when I expose myself to the previous book by reading the last chapter, I can pick up on many things including what is currently happening and where the next book will probably start off. This is not an entire reread. Ain't nobody got time to reread huge books when the sequel is sitting on your shelf waiting for you. Also, I will not only know where the sequel will be starting at but after reading the last chapter, I slowly start to remember a lot of the significant scenes that I may have forgotten about. Read a review of the previous book. When I'm starting a new book in the series and I can't remember anything from the last book, I always look to see if I wrote a review or some notes about it. Usually my book reviews, which are all spoiler free, will give me some insight in to what characters I liked or scenes I may have disliked. If I didn't write a book review or any notes on the book-- or the review didn't tell me anything at all-- I turn to some other book reviews around the blogosphere and on Goodreads to try to jog my memory. And you don't have to be afraid of spoilers because you've already read the book so these are the best book reviews to help you remember. There may be a recap in the sequel. This is more of a hope than a guarantee that you will remember the previous book. Some sequels recap the previous book in a sly or rather subtle way in the first few chapters (which I've talked about before). This requires just starting the next book in the series and hoping everything will come back to you. Look for recaps of the previous book online. I love finding recaps of books online. When I am about to continue the series, I always start with finding recaps before I do anything else because it is the most easiest and thorough way to remember everything that happened already. I tend to read the first book when it first comes out because I am so excited for it and then when the second or final book comes out, I can't continue because sequels are difficult! I don't want series to end! So, when I finally continue the series again, I look for recaps of the previous books. Two fantastic recap sites I use are: Recaptains and Book Series Recaps! 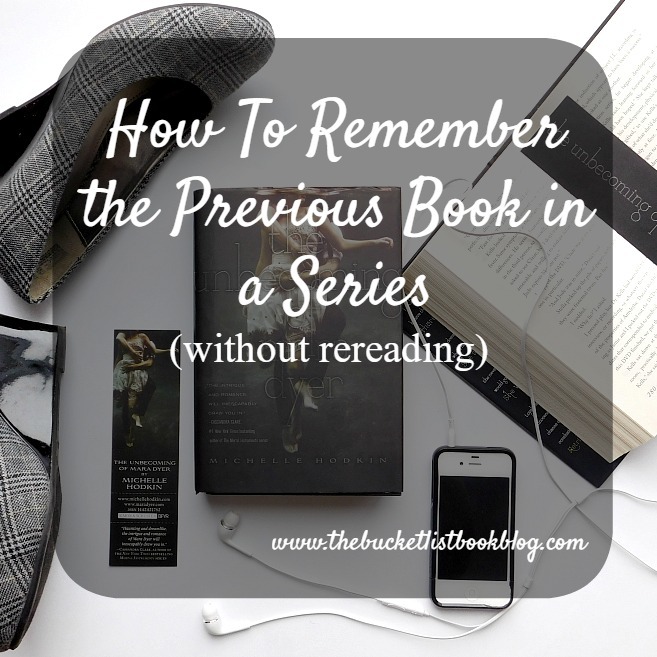 How do you remember the previous book in the series without a full reread?